NEB: DuBose 12-134, Jones 10-65, Jeff Smith 14-58, Turner 14-47, Tom Rathman 8-46. ISU: Richard Hanson 14-20, Tommy Davis 4-10. NEB: Craig Sundberg 3-5-0-25, Turner 2-7-0-24. NEB: Hiemer 2-23, Jason Gamble 1-14, Scott Kimball 1-14. ISU: Davis 3-3, Hanson 2-19, Tracy Henderson 2-11. The Husker defense held Iowa State to just five first downs and 53 yards in total offense as Nebraska recorded its first shutout in two years, 44-0, over the Cyclones. 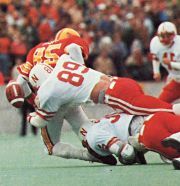 Iowa State's defense was tough, too, holding Nebraska to just a 10-0 lead midway through the third quarter, but an excellent 45-yard punt into the wind by Scott Livingston followed by a Bill Weber interception set up a 6-yard Doug DuBose touchdown run for a 16-0 lead, then the Huskers scored four touchdowns in the first 6:38 of the fourth quarter to blow the game open. The NU defense also managed to hold ISU's standout receiver, Tracy Henderson, to just two catches for 11 yards.